ประวัติ เปียโน HARRODSER PIANO since 1840. 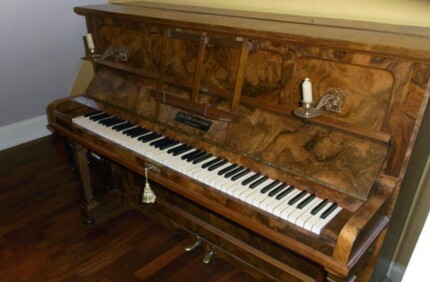 The Harrodser was a piano first appeared in 1840, which was handmade by Harold Bauer's father, Robert Bauer. 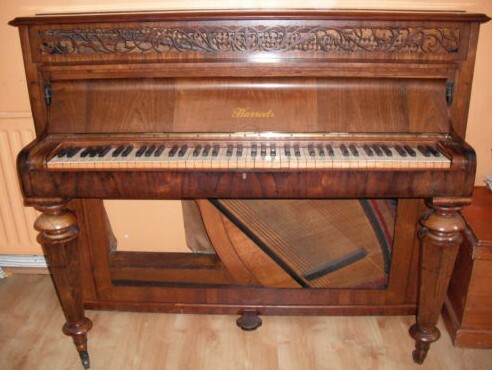 Piano Harrodser was entered into market as a customized piano really in the end of 19th century, which was designed and produced by the great piano master W. Danemann in 1893 with piano brand Harrods . 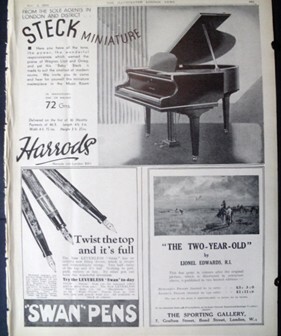 In 1931, Harrods set up his own factory in Düsseldorf, Germany and began to make Piano Harrodser customized. His ideal was to let the piano he made not only meet the needs of the royal family, nobles and professionals but also let the rich educated middle class realize that the road leading to the palace of music was not out of reach. Harold Bauer was born in a musical family in 1873, Surrey, Maldon, United Kingdom. He studied the violin from Britain's famous violin educator Adolf Lize from the age of 4 years . Loving for music from childhood, young Harold demonstrated his extraordinary talent. At the age of 6 years he began learning to music, and wrote the first Violin Sonata "Happy Romany". Only 9 years old, Harold began his first performance of his life. In 1888, Harold of 15-year-old held a public concert for violin and piano in his hometown, and was loved by the local people. In 1892, the 19-year-old Harold met a very important turning point in his life. When he had a chance to attend rehearsal of Tchaikovsky B flat minor first piano concerto instead of pianist Paderewski, he was highly appreciated by the pianist Arthur Schnabel and was recommended to go for further study in the Paris Conservatoire. During studying in Paris, Harold often played the piano accompaniment for tour singer, sometimes played solo. In August 1892, Harold held his first solo concert in Théâtre du Châtelet and became famous. In March 1893, Harold began his European tour. In the UK, the members of the royal family listened to the playing of Harold and were fascinated by his musical talent. At the Royal Banquet, Harold was often invited to attend to play and got acquainted with the famous piano master, W. Danemann. W. Danemann proposed that he could make a piano for Harold, they became good friends with each other and began to cooperate. Finally W. Danemann produced piano with the brand "Harrods' for Harold . Harold played that piano in concert, which completely expressed Harold's music style, meanwhile reflecting the exquisite skills of W. Danemann. Since then, many high society people came here especially to customize piano Harrods from Harold Bauer. The W. Danemann was famous piano master in 19th century, whose products had high quality, beautiful tone and sensitive touch. His production is very broad, covering different specifications of the piano. His piano had characteristic of that bass was stable and deep, alto was rich and warm and treble was clear and sweet such as Pearl singing. The materials of piano shell were well chosed meanwhile piano shape was gorgeous. Harrods Piano designed by W.Danemann, made of beautiful mahogany. 1853 in Berlin, in succession to establish three production workshops. Bechstein followed the old manual process of piano and manufactured with the highest standards of piano. The pianos of Bechstein were just as good as artistic treasures. 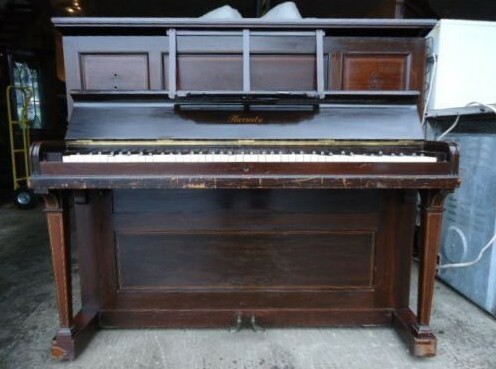 A piano Harrodser with model A-186, which important parts was damaged and its original sound was lost. Bechstein beautifully restored it to its former beautiful sound. Both sides trust each other. 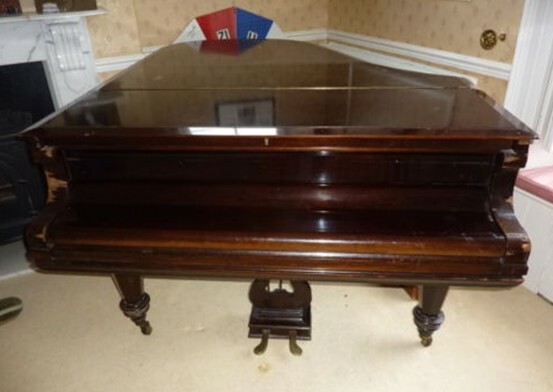 Harold commissioned the Bechstein specifically to produce Piano with Harrods brand as his customized piano. IN 1900, HARRODSER PIANO SHOW AT THE ROYAL PLACE. At the outbreak of World War I, Harold had to emigrate to the United States to avoid damage of war and became a citizen of USA in 1917. In 1918 he became the founder of the Beethoven Association in New York, and became visiting professor on piano performance professional playing in well-known Manhattan School of Music. HARRODSER PIANO BOARDED THE TIMES REPORTED. In 1922, Harrodser Piano boarded the times reported. In 1931, Harold returned to Germany to found his own piano factory in Düsseldorf with 45 employees and created a brand of piano "Harrodser" (meaning Harrods forever ). In 1932, the annual production of his piano reached 550. Harold often warned his son: "We only produce the best piano." 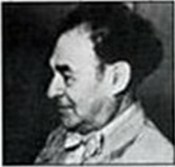 In 1941, Harold Bauer died. 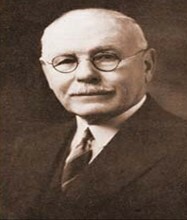 His son Bain Bauer continued to operate the company. Bain made improvement of piano process and focused all of his efforts on piano research, collection of new inspiration and new technology even if on his travel way, on exhibition and so on. In 1943, After Bain unremitting efforts, the quality of the piano has reached a new height. During 1960 -1971, Bain purchased three piano parts factory in Germany. In 1972, Harrodser reached annual sales 500 upright pianos and 200 grand pianos, become important one in Europe and America piano manufacturers. 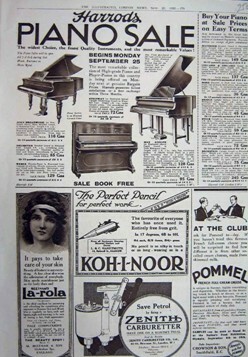 In 1922, Harrodser Piano publicized in the magazine. In the later 1980s, due to the lag of business strategy, Harrodser business began to shrink. In 1992, Harrodser employed Johannes Jütting as its CEO, who developed a clear strategic goals, implemented new marketing strategies and vigorously expanded the new market. Harrodser broke sales records, reaching 2000 pcs annually. 2002 Harrodser set up a new factory in Indonesia because of Indonesia's timber and labor cost advantages. 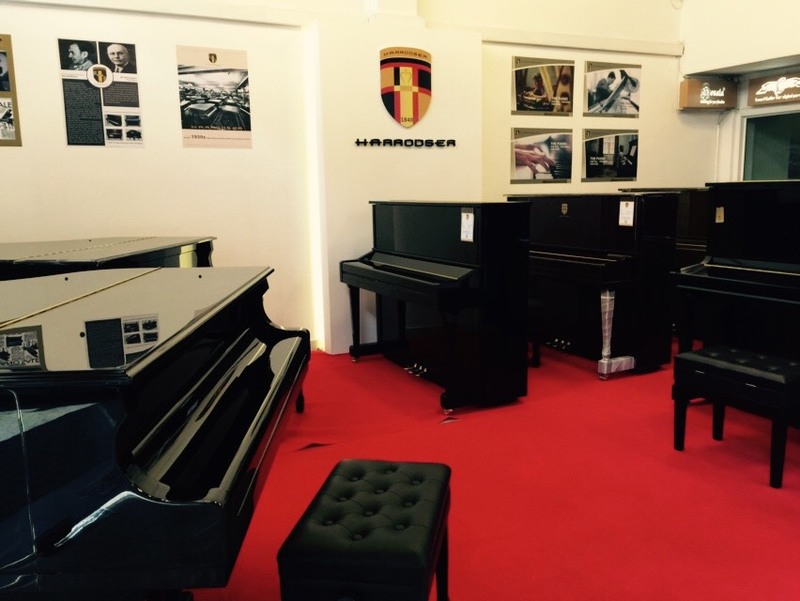 Piano Harrodser are made with modern equipment and high quality standard. Since its inception, Harrodser has always adhered to make “the best piano” (harrods for ever)" as its core concept brand and paid particular focus on the piano manufacturing technology and R&D. It takes several generations of Harold's family with unremitting process and technological innovation to win the reputation of the piano manufacturing experts and respects of musicians and great masters all over the world.